Monarch airlines is to ditch reclining chairs in its planes after a survey of customers found that they wanted them banned. According to the research, reclining seats are one of the top reasons for air rage. 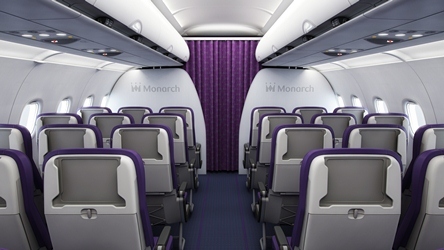 Monarch also said the new seats, due to be rolled out across its fleet this summer, would give passengers more leg room. The new, non-reclining thinner design is similar to that used in the car industry. The weight saving in the new design achieves significant savings on fuel and emissions. For instance, when compared with a set of Monarch’s existing seats, a set of new seats on a flight to Egypt saves 255kg fuel, which is equivalent to 816kg of carbon dioxide saved on a single flight. The seats will also feature a tablet holder so passengers can watch their own in-flight entertainment.